HOUSTON, TX. – The Associated General Contractors Texas Building Branch has honored Manhattan Construction Co. with the 2016 Texas Top Safety Award and the Zero Lost Work Day Award. The Associated General Contractors of America is an organization of qualified construction contractors and industry related companies dedicated to skill, integrity and responsibility. The association provides a full range of services satisfying the needs and concerns of its members, thereby improving the quality of construction and protecting public interest. Manhattan Construction is a member of the Dallas and Houston chapters of the AGC-Texas Building Branch. Team members (Chris Vollenweider: center left, Jeremy Ballard: center right) from Manhattan Construction Co. were presented the honors at the AGC Convention held June 12-15th2016 at the Horseshoe Bay Resort in Horseshoe Bay, Texas. Today, Manhattan Construction Co. announced that it has earned the Accredited Quality Contractor (AQC) credential, which is bestowed by the Associated Builders and Contractors (ABC). 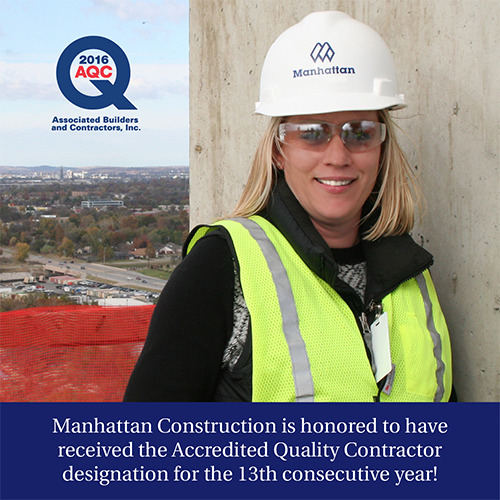 This is the 13th consecutive year that Manhattan has been recognized with the AQC designation. You are currently browsing the Manhattan Construction Group blog archives for July, 2016.